Although there is a growing concern regarding negative impact of partisan politics on higher education, particularly in Tribhuvan University (TU), the discourse of higher education reform has not received a great deal of attention in public sphere. While funding agencies like World Bank have been investing in the reform projects, the ideas of ‘centers of excellence’, and ‘academic reforms and relevance’, as claimed in World Bank’s Higher Education Reforms Project (HERP) document, have not received concentrated and sustained discussions among key stakeholders (students, professors, university executives and the general public). In this piece, I discuss two major issues—teacher professionalism and hiring and promotion system—concerning academic reform in higher education. Universities require a community of professionally committed teachers for quality academic and research-based activities. Professional commitment includes a deep sense of engagement in teaching, research, publication, community service and contribution to the knowledge. 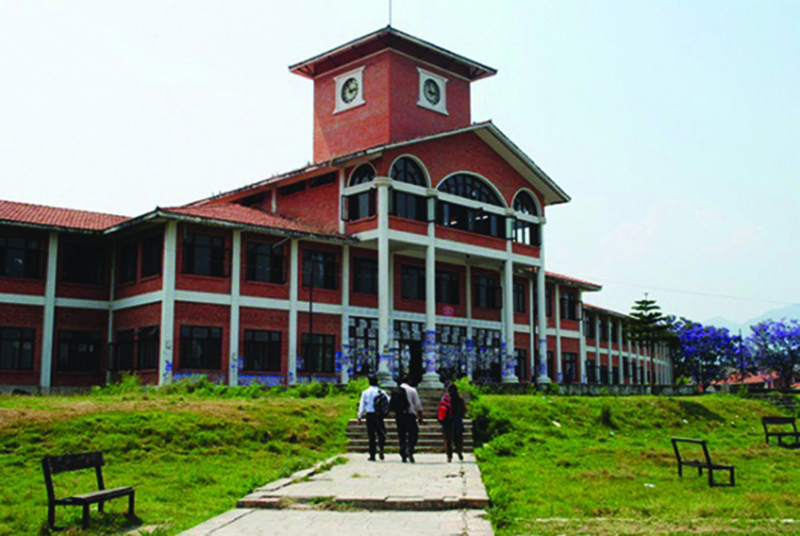 In the case of Tribhuvan University, the major problem, at present, lies in the teachers’ increasing withdrawal symptom that includes growing disinterest in taking classes, introducing innovations, and research-teaching integration. Exceptions aside, I gather, after talking with a number of teachers across the central departments and campuses throughout the country, three rough categories of teachers in terms of professionalism. First, there are professionally committed teachers with a strong teaching, publication and research experience. These teachers are not only passionate about teaching, but also introduce ‘innovative ideas’ through research and regular readings. More importantly, these teachers ‘empower students’ by providing ‘mentoring support’ and involving them in research and writing projects. Such professionally committed teachers have a strong positive public image among teachers, students and the general public. Despite all odds, these teachers keep working hard to address students’ learning needs and update themselves professionally. The second category of teachers would like to teach with innovative ideas informed by research but they do not know how to do. They hardly receive any institutional support for their professional growth. One teacher from one of the constituent campuses, for example, says “I would like to read some recent articles in my field and introduce something new in my teaching, but I don’t have resources. Our library doesn’t subscribe online journals and recent books.” Likewise, another teacher asserts: “I want to introduce new ideas in my class. But where do these ideas come from? Our campus does not organize any professional activities such as workshops, seminars and conferences. I have never received any support for professional development.” The teachers in this category show strong sense of frustration about ‘diminishing academic culture’ and ‘wish to receive institutional support for professional development’. More importantly, these teachers are critical about ‘growing favoritism’ on the basis of partisan politics and claim that their motivation for professionalism is negatively affected by ‘bhaag bandaa’ culture. The third category includes a significant number of teachers who are actively involved in partisan politics without paying much attention to academic activities and professionalism. Rather than having one common professional association, university teachers are affiliated to multiple associations serving in political parties’ sister organizations. Leaving some exceptions aside, the teachers in this category are not much focused on teaching, research and publication. Rather they spend most of their time in lobbying with political leaders and the university executives for the recruitment, transfer, promotion and appointment of teachers and personnel who hold the same political ideology. My own observation shows that most teachers who lead these associations belong to the departments that have very few students (may be less than 10) and have less teaching loads and other academic and professional responsibilities. What is most unfortunate, in the context of TU, is that the teachers under these categories are the most influencing force in the discourse of higher education reform agendas. The university executives develop policies and are compelled to appoint Deans, directors of research centers, campus chiefs and other executives based on the recommendation from the leaders’ of these association. Consequently, the voices of professionally committed teachers who want to contribute to the institutional growth through teaching, research and publication are dismissed, remain unheard and become meaningless. There are two major ways to strengthen teachers’ professionalism. First, the university should develop and implement policies and plans for enhancing professionalism. For this, it is necessary to strengthen capacity of central departments and campuses so that they can be more accountable to provide their teachers with necessary support for their professional development. Second, and more importantly, it is necessary for the university to establish separate institutional arrangements such as Teacher Professional Support and Writing Center in each central department and campus to provide teachers and students with professional and academic supports. This way the university can gradually mitigate growing culture of partisan politics and strengthen academic and professional rigor. Teacher hiring and promotion system remains at the core of higher education reforms. A transparent and scientific hiring and promotion system that focuses on research, knowledge production and teaching help teachers grow professionally. In order to strengthen TU’s academic culture, it is necessary to reform the existing teacher hiring system which focuses much on testing content knowledge rather than candidates’ research, publication and professional skills. The existing system of taking one-shot written exam as a gateway to select university teachers is less helpful to select young talented researchers. To address this issue, the departments/campuses can be given a full responsibility of hiring teachers. For this, the University Service Commission should revise its hiring policies and focus on candidates’ research, presentation/teaching skills, community service, interpersonal communication and commitment to institutional growth as major competencies for hiring. More importantly, rather than asking the candidates to sit in a written test and follow-up interview (which has been very ritualistic), the university can ask the candidates to submit their publications, letter of recommendations, diplomas/honors, research reports, statement of community service, teaching philosophy, research statement and their long-term plan for research and teaching. The university can form a group of external experts (from around the globe) who can anonymously review the candidates’ publication, research reports, teaching philosophies and other contributions and send their comments to the university. In addition, the short-listed candidates’ classes can be observed and they can be asked to make a public presentation on areas of their research interest. These ideas may sound ambitious but TU should at least start working toward this direction for possible reforms. The teacher promotion system, closely related to the hiring system, is another major reform agenda. The existing teacher promotion system in TU is obsolete in many ways. First, the existing system gives more emphasis on the number of years (anubhab) teachers have spent in the university than their research, quality of publications, conferences/workshops and other academic/professional activities. In the existing system, young teachers with sound academic, research, publication and professional records have a slim chance of being promoted. But the teachers who have spent more years (nobody cares whether they have actually taught) in the university without publishing, presenting in the conferences, conducting research, and serving to the community of professionals are automatically promoted. This obsolete system has not only been demotivating, but also supporting the status quo. Eventually, this system has a direct impact on the present withdrawal symptom of teachers and diminishing academic culture.